Christmas is coming...house is being decorated...and the cookie jars are out. Cookie JARS? Yes, I have four cookie jars that are sitting out on a table that simply must be filled for all to enjoy. The penguin jar has Oh Fudge; the Santa jar has sugar cookies. The Christmas tree and snowman jars need something still..
Last night I started going through recipes thinking of what should go in the Christmas tree jar and cam up with the ever famous Peanut Butter Blossom cookie...my favorite because it mixes chocolate and peanut butter together. What could be better than that? 1. Unwrap all Hershey Kisses. 2. Place the first nine ingredients in the bowl of your mixer and mix until creamed. Remove bowl from mixer, cover and place in the refrigerator for a minimum of 30 minutes. 4. Remove bowl from refrigerator and shape into 1-inch balls. 5. Roll balls in the 1/2 cup white sugar and place on cookie sheet (ungreased) approximately 2 inches apart. 6. Bake 8 to 10 minutes or until very light golden brown. 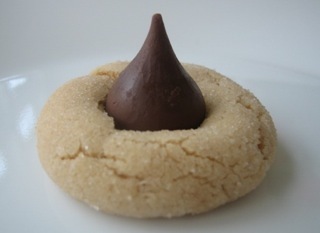 Immediately remove from oven and press one Hershey Kiss into the center of each cookie. 7. Remove from cookie sheets onto rack for cooling. Note: Although I love the flavor of these cookies, I would love to tried these cookies with Peanut Butter & Co's Dark Chocolate Dreams peanut butter...more chocolate is always better, right?